Comprised of thousands of different products and services, the automotive aftermarket is an extremely diverse industry, with automotive metal fabricators offering a range of products for consumers and businesses alike. However, in such a crowded field, quality can vary greatly, so it’s important to partner with a company that can consistently manufacture reliable, high-performing parts. Automotive metal stampers are often the best option, as metal stamping is an ideal method for aftermarket part production. With continually improving metal stamping technologies, today’s automotive metal stampers operate state-of-the-art equipment that can produce parts with extreme precision and very tight tolerances. Also, a wide array of metals — from copper to stainless and carbon steel to exotic alloys — can be efficiently stamped. Automotive metal stamping is a very cost-efficient manufacturing process — particularly important for the automotive aftermarket industry, which operates on slim margins. Metal stamped aftermarket car parts provide the same quality and reliability as original equipment manufacturer (OEM) parts but at lower costs. Based in Gurnee, Illinois, American Industrial Company (AIC) is a family-owned metal stamping company with 35 years of experience in automotive metal fabrication. Fully ISO 9001:2008 certified, quality is our primary goal in everything we do — from the tool and die phase, in which we design and build in-house with our cutting-edge equipment, through design and engineering services, prototyping, and full-scale production runs. At AIC, we understand the importance of staying up to speed on emerging automotive aftermarket industry trends and automotive aftermarket news, and we provide only the highest-quality services and the most efficient stamping capabilities. 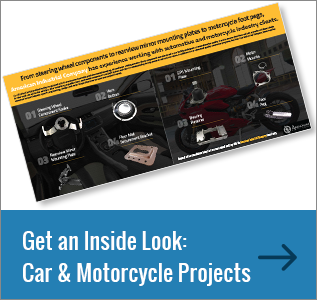 To learn more about how American Industrial Company can help you design and manufacture high-quality, cost-efficient aftermarket car parts and aftermarket auto body parts, download our free automotive aftermarket infographic today.